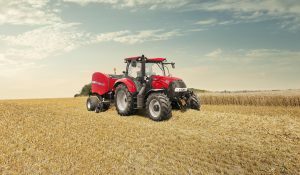 Two new Case IH tractor models will be in action for the first time in the UK at Grassland and Muck 2017 on 24-25 May, renewing the brand’s offering in the key 100-150hp mid-hp category. The company’s upgraded fixed and variable chamber balers will also be demonstrated. The Luxxum 120 on show has a rated power output of 117hp, while the rest of the range includes Luxxum 100 and 110 models with 99 and 107hp respectively. All use new 3.4-litre four-cylinder engines from Case IH partner FPT Industrial. Stage IV emissions legislation is met via patented Hi-eSCR-only exhaust treatment, while respective diesel/DEF capacities are 150/14 litres. It comes with features and options normally only seen in larger machines, including the Multicontroller joystick, which operates key functions including gear and direction selection, linkage and spool valves, and the Multicontroller armrest on which it is mounted, which also incorporates a split throttle for max/min engine speed settings, plus controls for hydraulic and transmission tuning. A new 32F/32R automatic powershift transmission with four powershift steps and eight ranges provides 40km/h travel at 1,730rpm and features adjustable powershuttle response and speed selection. An auto field mode shifts through the lower 16 speeds, while auto road mode moves the transmission progressively through the higher 16 speeds, each mode operated via a single press of an armrest button, or through each speed via buttons on the rear of the Multicontroller joystick. In auto mode downhill safety is enhanced by the ability to manually override upshifts and prevent heavy trailed loads from jack-knifing. With 80mm of movement, front axle suspension damping is controlled via an accumulator and regenerative valve system. It also provides the ability to raise lower the tractor’s front-end via a console-mounted switch to boost traction in the field and improve stability and comfort on the road. 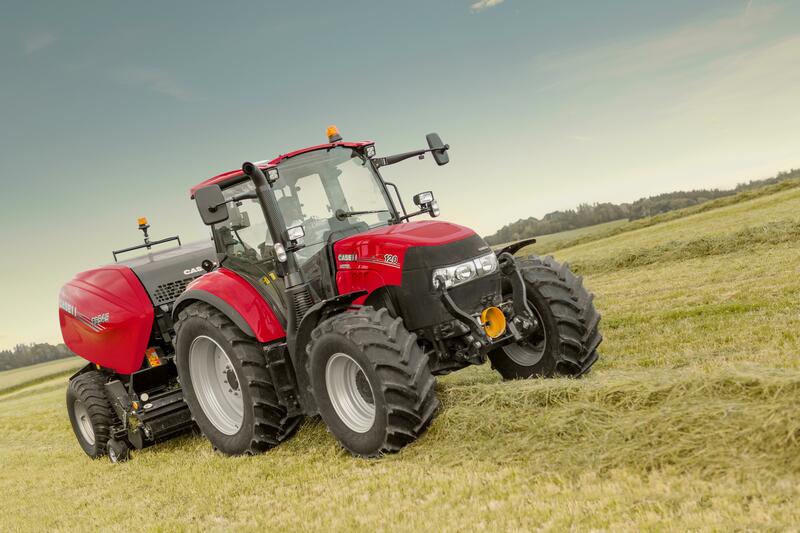 The Maxxum 145 CVX on show is one of fourteen different versions in the new Maxxum series. They are available as standard, Multicontroller (MC) or CVX models, with 4.5-litre four-cyl engines spanning rated power outputs of 116-145hp (145-179hp with PTO/transport boost). There is also a 6.7-litre six-cyl 145/179hp alternative, the standard or MC Maxxum 150. FPT Industrial NEF engines incorporate selective catalytic reduction and a diesel oxidation catalyst, with no diesel particulate filter. Upgrades include new lighting, single-piece windscreen with revised wiper and larger 650/65 R38 rear tyre option, plus improved front axle damping, longer wheelbase and electronic vibration suppression, while colour-coded, relocated spool valves simplify connection. HMC II headland management improves programming while, on Maxxum CVX, compatible implements can be ISOBUS-operated through Case IH’s AFS terminal. Where capable, implements can also control tractor functions such as forward speed and PTO speed. Being demonstrated behind the Luxxum is the new 122cm x 125cm RB 545 fixed chamber round baler, which features a new 220cm pick-up with 5.5mm tines on five tine bars. A 20-blade chopper is standard, offering 0, 10°, 10B or 20-blade engagement, with 52mm minimum theoretical chop length. A hydraulic drop floor is standard with the option to add a rotor de-clutch system for increased protection, and ten-rib chamber rollers replace the former four-rib units. A faster-operating duckbill system wraps netting over the bale edges. Paired with the Maxxum will be Case IH’s new RB 455 variable chamber round baler. It comes either with 4 bar 2.05m or 5 bar 2.35m pick-ups combined with a W-configuration rotor in both Feeder and Rotor Cutter versions for consistent, no-loss intake, providing up to 25% more capacity. An entry-level Overshot feeder completes the range. Case IH will also be demonstrating their well-established LB334 large square baler behind the popular Puma 240 tractor. Case IH is the professionals’ choice, drawing on 175 years of heritage and experience in the agricultural industry. A powerful range of tractors, combines and balers is supported by a global network of highly professional dealers dedicated to providing our customers with the superior support and performance solutions required to be productive and effective in the 21st century. More information on Case IH products and services can be found online at www.caseih.com.